The “Three Wise Monkeys” is a popular symbol of the “See no evil, hear no evil, speak no evil” proverb popular in many cultures around the world. The proverb itself is thought to have originated in China and was brought to Japan by a Buddhist monk, while the association with three monkeys appears to be a Japanese play on words. The Paul Chen / Hanwei Three monkey katana and Three monkey wakizashi are built on traditional Shinogi Zukuri style blades, fullered to reduce weight and improve balance. The high-carbon blade is hand forged and differentially hardened. 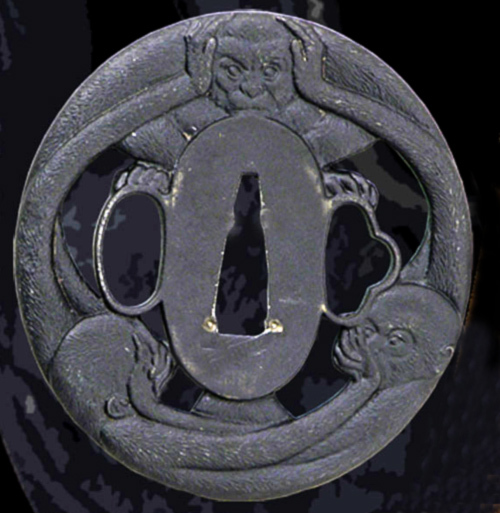 The blackened iron tsuba features the three wise monkeys.